Third-party smartphone apps have been there from the early Symbian days. But the revolution really took off with the arrival of iOS and Android. Android and iOS with their centralized app store concept managed to attract tons of users as well as developers. Apps can be clubbed into 3 different categories basically; free (ad-supported), paid, and freemium (where users have to do in-game purchases to level-up and such). There are plenty of apps that command top dollar and help to make their creators very wealthy. You may be familiar with this one, all too familiar. There’s even an Angry Birds inspired theme park in Finland. This app started as a sideproject in December 2009. Originating from a list of ideas that designers were considering for possible apps. The concept of round and colorful bird characters stood out enough that it was the one that the programmers decided to go with. Results were staggering to say the least. There are several versions of the game available and each Angry Birds game app sells for 99 cents apiece. Within a year of its introduction, the game had generated well over $7 million in revenue and that figure continues to climb. 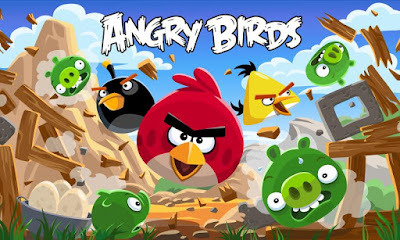 In 2011, the company that produces the game, Rovio, claimed $106.3 million in total revenue, with a large portion of that being attributed to Angry Birds alone. So much for being one of the most downloaded games ever. 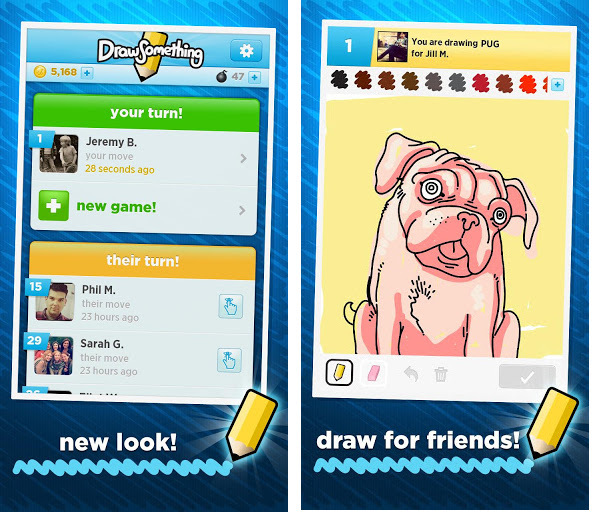 Draw Something is one of those game apps that has millions of users but remains an underground sensation. It is similar to the board game Pictionary where one player draws an object and the other has to guess what the object is. The game ties into Facebook and allows people to set up games with friends on Facebook and also play the game on Facebook as well. The company that created the game is called OMGPOP, and that company was purchased by another developer call Zynga for $180 million. The estimated revenue for Draw Something is $250,000 per day. 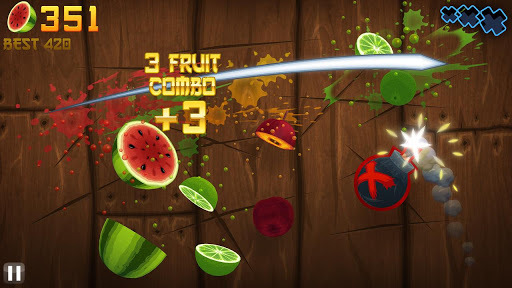 If you watch the newest Geico commercial with the talking pig, you may have been introduced to a game app called Fruit Ninja. Contrary to popular belief, it is not a game created or owned by Geico. The game started as a way to call attention to the challenges that Native Americans and farmers in the United States are experiencing. It was released as a free trial version and a full app that people could buy. Since its release, the free version has been downloaded 14 million times and it has sold six million full versions. It is estimated that Fruit Ninja brings it approximately $400,000 per month in advertising revenue alone. People love to listen to the radio when they are at work or driving in their car. For years, the idea of subscription radio had been a difficult sell to the general public. The only subscription radio service to survive was Sirius, and even that company is still experiencing financial difficulties. But the Pandora radio app takes things to an entirely new level. Users can create their own custom stations or listen to stations based on their favorite kinds of music. There is a free version of Pandora with limited play lists and commercials, and there is a free version that does not have commercials and offers access to over 700,000 songs. The last count of paying Pandora subscribers, at various subscription rates, was just over 50 million. The company reported that, for the second quarter of its 2013 fiscal year, it generated $101.3 million in revenue. It seemed like a natural progression when Take-Two Games, the creators of the Grand Theft Auto franchise, announced that it was going to release apps of its games for use on a variety of mobile computing platforms. For the third quarter of 2012, Take-Two estimates that the entire Grand Theft Auto franchise generated a little over $250 million in revenue. The mobile apps made up around 11 percent of that revenue, which would mean around $27 million in mobile app revenues for a three-month period. One of the most popular types of app games is the jumping game. The concept of these kinds of games is extremely simple. 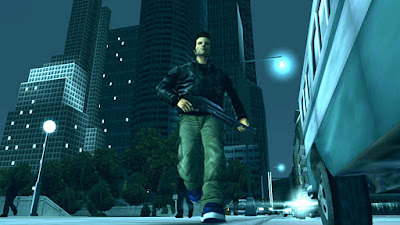 There is a main character that continues to jump up to new levels in the game, but the character also experiences several challenges along the way. This basic concept has spawned a whole genre of games with hundreds of game titles. One of the most successful jumping game apps is a game called Doodle Jump. 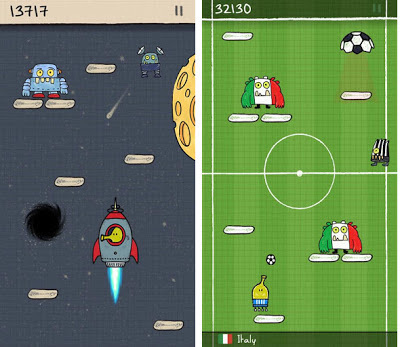 Developer Igor Pusenjack says that his company enjoys creating games with hand-drawn graphics, and that is how Doodle Jump came about. The app has been downloaded over seven million times at a cost of 99 cents per download. After paying Apple the necessary fees for marketing the game, Pusenjack and his company have pocketed over $5 million. 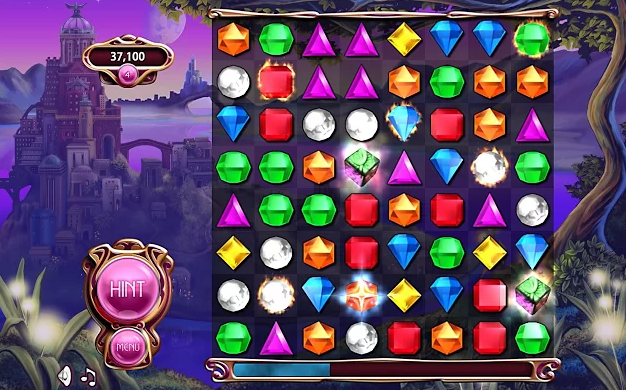 Bejeweled is a game app that has remained one of the most popular apps on the market. It continues to be the highest selling app offered by its developer PopCap. The game has had over 50 million paid downloads since its introduction in 2000. In 2012, video game giant EA Games announced that it was buying PopCap for approximately $1.3 billion. It is estimated that PopCap generated $120 million in revenue in 2011 alone. You would expect a game called Flight Control to be a mobile flight simulator. 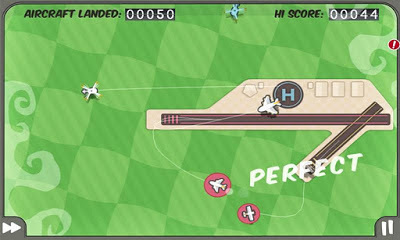 But it is actually a game where you have to use your finger to help planes safely land at a virtual airport. It starts out easy with just a few planes, but the pace picks up as the player shows an aptitude for the game. 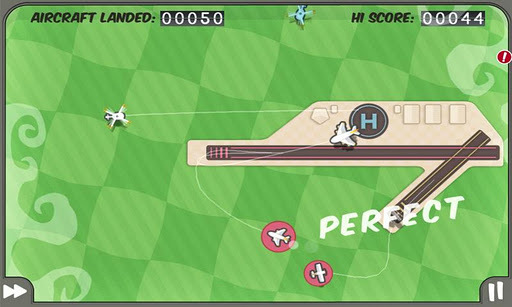 The game was created because developer Robert Murray always enjoyed drawing games on smartphones, but he wanted to add in the angle of being a airport flight controller at the same time. Since it was released, this little game app has had approximately 3.8 million paying downloads since 2009 at $4.99 per download. That makes an approximate total revenue of $19 million. This is an aptitude game designed by brothers Berkeley and Steven Malagon. The game play is simple, which is the plot of the game. The brothers never expected the game to take off the way it did, but it has been responsible for over two million paid downloads to this point. The brothers do not reveal the inspiration for their game, but they do mention the jobs they were working while developing the game as being a source of inspiration. It is estimated that the net revenue for Moron Test sales in 2010 was approximately $2 million. Selling apps for smartphones and other mobile computing devices can be a lucrative business if you have the right idea. It’s a hot market to be apart of, but how does one break through to the top? Well, it’s like anything, a little bit of luck and a good idea goes a long way. As mobile technology continues to develop, so will its apps. Someone somewhere is developing a new app that will be the next big thing. Angry Birds won’t be on top forever; don’t you want to be around for the next wave of gaming apps? It can take time to develop and have it take off, but the success can be rewarding when your idea finally takes flight. Article contributed by Joseph Stark Jr. A freelance writer and blogger by day, focusing on technology and web design niches. By night he is a tech junkie, gym member, and avid comic book enthusiast. When he’s not out in his garage modifying his computer, he’s playing around on his Android cell phone. Friend him on Facebook and say hey.